Don’t be sad that she’s gone, smile because she was here. That’s the theme. There is history, humor and happiness in this obituary. 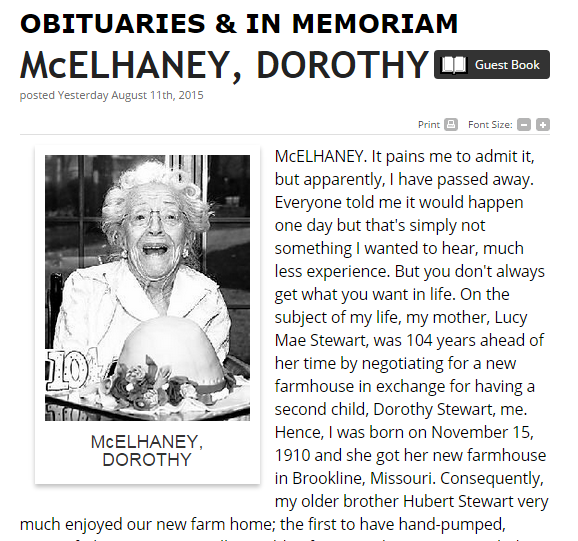 Dorothy McElhaney – writes her own obituary about her life of 104 years. This is a nice read, which takes you back to her birth in 1910. She talks about her mom. She talks about her home growing up where they were, “the first to have hand-pumped, gravity-fed running water, albeit cold.” She takes you back to a different era of a one room schoolhouse, attending pie suppers, her mom wearing an apron, daddy driving cattle to the market with her favorite dog and raising chickens to sell the eggs for spending money – to touch on just a few. Read her humorous, historical and happy obituary here. You can see her sense of humor. You can see the energy which carried her through a long wonderful life. She says, “please don’t cry because I’m gone; instead be happy that I was here (or maybe you can cry a little bit. After all, I have passed away).” It has been noted that her obituary is modeled after another from earlier this year – a woman woo passed away in Jacksonville, FL named Emily Debrayda Phillips. That obituary is here. Previous articleBaby Smiles With New Glasses!